A Canadian couple spent month after freezing month chronicling harsh Antarctica. Their exacting approach produced a 27-pound book as majestic as its otherworldly subject. Antarctica is unforgiving. Small mistakes can be deadly. But Rosemarie Keough wasn't thinking about danger on the morning the blizzard started. She was focused on the emperor penguin rookery a mile from camp. "I already had a lot of images of penguins in sunshine," she said, "and I'd come to photograph Antarctica in all of its conditions." So, rather than hole up in her tent and wait for the storm to pass with the other expedition members, Keough pulled on layers of clothing, loaded three 35-mm Nikons and set out toward the rookery along a half-mile-long path marked with bamboo flag poles. The 4,000-bird flock had moved another half a mile beyond the last pole since the group made camp nearly three weeks earlier. But luckily for Keough, they were still visible from the end of the line. Hours later, after she had used all her film, Keough realized that getting back would not be as easy. The storm had worsened into a total whiteout. "It's a strange feeling," she recalled. "You have no perception of depth or direction. Everything is white, the sky, the land, the water. You can't tell what is what." Unable to see the pole line, Keough could only guess in which direction camp lay. She thought about trying to find her way, but then, haunted by the knowledge of how wrong things could go, decided to hunker down near a sleeping penguin and wait. "My husband was thousands of miles across the continent photographing another group of emperor penguins. I remember thinking, 'I hope you find these cameras, on, because I got some really good pictures.' " Hours later, the expedition leader, who had earlier tied a rope to the pole closest to the birds, found her and showed her back to the tents. Does Keough wish today that she had just stayed in her tent? "Of course not," she says. "One of those pictures became the title page of the book." Physical comfort was one of many sacrifices for "Antarctica," a 336-page, 27-pound limited-edition beauty that sells for $2,900. The book was more an obsession than a project for Keough and her husband, Pat, who put up hundreds of thousands of their own dollars, traveled tens of thousands of miles and spent month after freezing month in the wilds, most of the time with their then-7-year-old son in tow. With the photography done, they scoured the world for the materials and artisans to create the book they envisioned. The cover leather comes from goats raised in India, Pakistan and Bangladesh. It was tanned in Scotland using ancient methods. The velvet for the flyleaf is French. The paper was specially milled in Wisconsin. The binding proved the biggest challenge. Pat Keough had an idea for combining two traditional binding styles to create something strong and beautiful, a technique that would require artisans to try something new and extremely difficult. Eventually a Canadian firm accepted the challenge of hand-binding the press run of 950 books; 268 have sold so far to Antarctica enthusiasts and fine book collectors.
. It's a dedication to something I can't quite even understand. It has nothing to do with marketing or making money. It's extraordinary." Last month at the International Photography Awards ceremony in Los Angeles, "Antarctica" won photo book of the year and the Keoughs shared the award for nature photographer of the year, the highest honors in these niches. And the awards barely hint at the majesty within "Antarctica." The photographs capture the broad sweep of the continent: the snowy plains and glaciers and ice-filled seas. But they also isolate details, such as a pair of Adelie penguin feet left by a predator on the snow. One shows an abstraction, the breast feathers of an emperor penguin glowing in the soft gold of an Antarctic night. 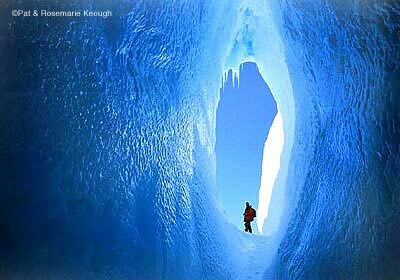 There are shots of green snow and pink snow (algae colors), of purple sunsets, of deep blue ice caves and crevices. The book documents the human impact on Antarctica as well. The interior of the hut constructed in 1911 by polar explorer Robert F. Scott appears eerily unaltered. "There are no visual cues to the passage of time," said Rosemarie Keough. "There are no spiders in Antarctica, so there are no spider webs. The dust is frozen down, so there's no dust on anything." Strangest of all, she said, was something film could not capture. "Outside, it's so cold and dry that there's no odor, but inside, you smell Scott's men. It feels like they just left a few moments ago." Rosemarie, 44, and Pat, 58, met in 1984 on a guided canoe trip on the Nahanni River in the Northwest Territories and married a few months later. Within 2 1/2 years, they had both quit their jobs in business, determined to turn their love of nature, adventure and photography into a living. Their first venture was a self-published photo book about the Ottawa Valley in Canada, where they lived. It sold well enough that an established publisher bought them out and gave them a deal for two more books, both of which did well. But the Keoughs wanted to bring out a book as perfect in its way as the nature they documented. With the windfall from a property sale near their home on Salt Spring Island in British Columbia, they decided to attempt "Antarctica," the first in what they hope will be a series. Profits after production costs will go to Birdlife International's Save the Albatross fund. The couple says their next project will be equally ambitious and focus on either the desert region around Palm Springs or the Pacific Northwest from Washington up through Alaska. Was the endeavor worth it? The Keoughs' son, Glen, now 10, thinks so. Instead of going to school during the two Canadian winters his parents photographed "Antarctica," he roamed over icebergs, built an igloo and worked with a scientist who sent him into flocks of Chinstrap and Adelie penguins to haul out dead ones for autopsy. "Some people go to Palm Springs for a week and call it a vacation," Glen said. "But this was a lot more fun than that." For details on "Antarctica" go to http://www.keough-art.com or view the book at the Fahey-Klein Gallery at 148 N. La Brea, Monday-Friday, 10 a.m. to 6 p.m.